Statbook allows you to keep track of baseball or softball , and now, with version 3, basketball and soccer, all for the same low price of $20. Easily enter statistics, customize reports and then create an entire website with the click of a button. 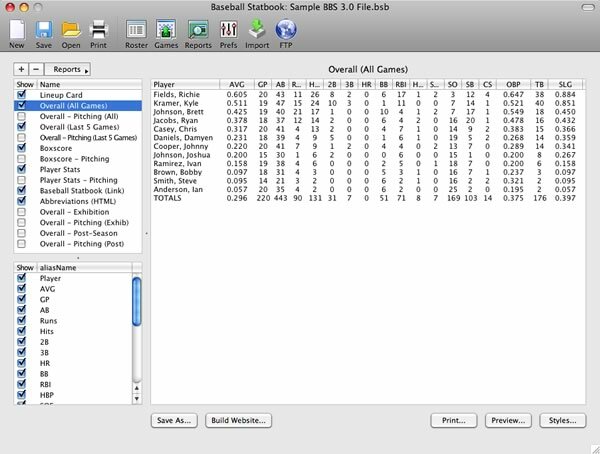 Statbook is also ideal for Pony League baseball and softball as well as any other baseball, softball, basketball or soccer teams (High School, Club, etc). If Statbook does not have enough features, be sure to submit a feature request. With Statbook, you first add in team name and roster information. Once your roster is completely filled in, you will then start adding in game information. In addition to these reports, you can create as many custom reports as needed. There are also options that allow you to add header and footer information to your reports. The best thing to do is to download and try out Statbook and then let us know of any features you would like to see added. Also, be sure to visit the documentation area for additional information.